Lean NFV Ops: automation and self-service. “The automatic telephone switchboard was introduced in 1892 along with dial telephones. By 1929, 31.9% of the Bell system was automatic. Automatic telephone switching originally used vacuum tube amplifiers and electro-mechanical switches, which consumed a large amount of electricity. Call volume eventually grew so fast that it was feared the telephone system would consume all electricity production, prompting Bell Labs to begin research on the transistor. The logic performed by telephone switching relays was the inspiration for the digital computer.” – “Automation” by Wikipedia. 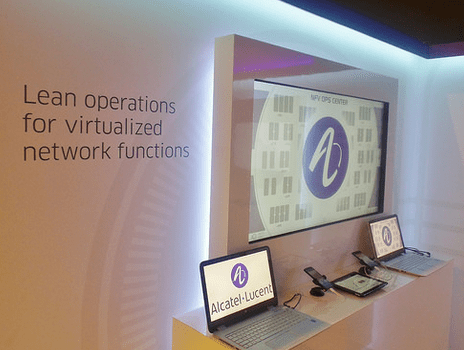 We kept extremely busy in Q1 to deliver the Lean NFV Ops demo at Mobile World Congress back in March. I am glad to share that the project’s success led to a hectic roadshow in Q2: our live demo system has been showcased at a number of industry and private events as well as in customer workshops worldwide. Each conversation with network operators, partners, analysts and public officials has delivered a wealth of insights: most validating the project’s objectives while some challenging us to do even more to take things to the next level. Q3 is about furthering the Lean NFV Ops conversation and we will soon make available a brief paper and a full length video sharing design principles. Stay tuned. Though, I would like to first start with a brief discussion on S2O (Self-Service Ops) given a recent batch of questions on what that entails. S2O, this post’s focus subject, reflects the fact that a number of CSP (Communication Service Providers) are developing B2B (Business to Business) markets by providing services to other network operators under the carrier’s carrier model, MVNOs (Mobile Virtual Network Operators) and enterprise verticals and customers of all sizes. Though, we are also learning about lengthy resource consuming operations that trigger costlier services than planned and/or limited offerings constrained by what can effectively be managed under the current PMO (Present Mode of Operations). Thinking of Network Functions Virtualization (NFV) means shifting to a FMO (Future Mode of Operations) based on cloud economics. More specifically, this means enabling business models such as Infrastructure and Platform as a Service (IaaS and PaaS) which are driven by self-service interactions. B2B: A CSP is in business with several customers (other carriers, MVNOs, enterprises, public administration). XaaS: A given CSP’s customer works with the same toolset leveraged by the CSP’s own in-house ops team and benefits from the “X” (anything) as a Service model. DevOps: That CSP customer’s own IT team embraces self-service by deploying apps and creating service chains at multiple sites, scaling and reconfiguring systems as needed. Left: Screen capture of the demo’s NFV Ops Center – S2O View. Right: Screen captures of support systems involved: Motive Dynamic Operations, CloudBand Management System, Nuage Networks, Bell Labs Analytics. The CSP’s business customer is empowered to best conduct timely operations as they see fit. The CSP leverages automation to reap self-service efficiencies whether that involves in-house teams or those engaged by business customers themselves. 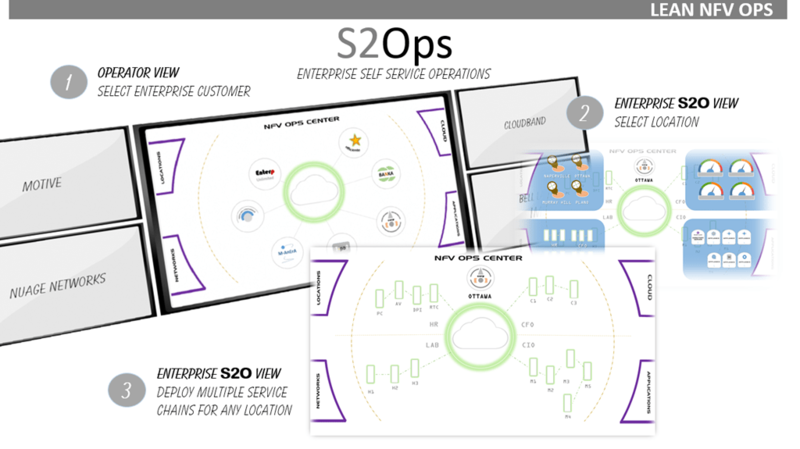 S2O prompts CX (Customer Experience) implications encompassing fulfillment and assurance, as well as consumption based pricing models, in a highly dynamic environment, which makes Lean NFV Ops’ end-to-end system engineering approach of the essence. Lean NFV Ops: Demo Script. Lean NFV Ops: scaling basics.